How would you like to vacation at a beautiful riverside lodge at the edge of a colorful Alaska frontier town? 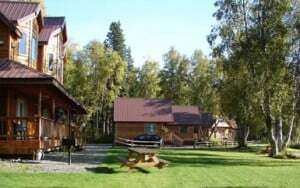 Susitna River Lodge is located in the historic village of Talkeetna, Alaska on the east bank of the Susitna River. We first happened upon SRL in April of 2011 for a week during our Grandson’s Easter break. We have had many vacations in our 50 years of marriage but we both agree that the week at SRL was the best vacation we had had up to April 2011. We returned for 12 days in 2012, again in 2013, 2014, 2015, 2016, and will be going back this year (2017). There are many daily adventures you can enjoy while staying at SLR: we have done the Hurricane Train, the River ride, the Zip line, the Denali park tour, the plane ride landing on Ruth glacier all while staying at SRL. We have also just sat by the river, kicked back and did nothing. To us, SRL is an almost magical place. The view of Denali is majestic, the sounds of the river soothing, the grounds and the cabins are clean and well maintained. Darlene, Howard, and the staff have ensured that our stay is as good as it can be from our first stay to our last. We stayed at Susitna River Lodge for one night, as we travelled between McKinley Park and Seward. Our lodge room overlooks the Susitna River, which is totally mesmerising as its waters flow by. The room is very attractive, comfortable and well cared for. Talkeetna, a short walk away, is an interesting small town with a quirky museum, "Talkeetna Historical Society Museum"; a must visit, if you wish to understand the town's origins. The town centre has a mix of original historical buildings, as well as reconstructions. Lots of eating venues and gift shops. Talkeetna is a good base for walking; including expeditions to Denali (formerly known as Mount McKinley). I stayed in the main lodge for five days during the first full week in April of 2013 and thoroughly loved every moment. The room was huge with all the amenities one could want; the views to the east and south were gorgeous. The staff were extremely helpful and very friendly. Despite a bit of angst regarding the whole house hunting process I always slept very well at Susitna River Lodge and did locate my retirement home. 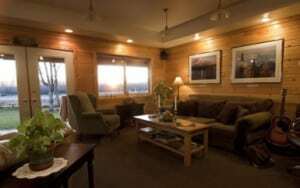 I recommend the lodge to anyone visiting Talkeetna! If you are traveling as a couple or as a family, this is an exceptional lodge to stay. Bring your own food or eat at nearby Talkeetna. The lodge is comfy and rustic. We stayed in rooms in the lodge rather than an individual cabin. We had side-by-side rooms which worked out well since we were three adults and two kids. The lodge is on the river and as a bonus, you can see the Northern Lights without having to drive for hours to get away from city lights. Nearby Talkeetna is only a mile away and a pleasant walk along the wide highway. I would come back here and stay alone - it is so comfortable and the owners are kind and welcoming. Our family gives this place ten thumbs up! The kids do not want to leave. We stayed 2 nights, would've extended our stay if the cabin wasn't booked up for a follow on wedding party. Our host was the perfect concierge in all aspects...We made cabin reservations online with her effortlessly. Upon our arrival, she was sincerely friendly with best ever customer service; she gave us helpful information on things to do and see around town. We stayed in Cabin #4 which had the best view of the river from among the 4 cabins there. The place was nicely furnished and exceptionally clean, beds were comfortable, and the front porch view of the river and distant mountains was priceless. The kitchenette amenities/utensils were beyond our expectations. We borrowed a hot plate and pot from the host as there were no stove top in the kitchen. WIFI was unreliable in Cabin #4 as she had warned, but since the lodge's very inviting lobby is open all night, it was no issue to do a short scenic walk to the lobby for perfect WIFI. We saw a black bear, a ptarmigan/snow chicken, ravens and magpies from our cabin. The place was really quiet, perhaps from being there in off season. It was truly a Godly blessing to have stayed there. If you don't mind a little walk from the cabin for WIFI, but want quality accommodations, majestic views, reasonable rates, and superb customer service, this is your place. The place was just wonderful, charming decor, clean, gracious accommodating staff, made recommendations for places to eat. Coffee was hot and delicious on that wrap around porch overlooking the river. I had absolutely no trouble making the reservation online, and wish I could have stayed longer. I will definitely stay there again if I find myself in Talkeetna. “Susitna River Lodging is a great place to stay in winter” Four co-workers and I shared a cabin while in Talkeetna for the Bachelor Auction. Staff was very accommodating and friendly, Cabin comfortable with plenty of room for socializing and everyone slept comfortably. Bedding and pillows nicer than I expected in a "cabin". Kitchen is tiny but has large toaster oven, microwave, crock pot, toaster, coffee maker. All dishes we needed were there as well as dish soap. No TV but we didn't miss it. Electric fireplace was a nice touch. Spent our 30th Anniversary night here in mid-June 2014. Beautiful, well appointed, and roomy accommodations with a great view of the river. The staff was very pleasant. In all of the places that we stayed as we toured Alaska, this was probably the best. We were pleasantly surprised, or should I say impressed. The service was great. The cabins are very, very clean and comfortable. I can't say enough good things about our stay. You definitely can't go wrong if you choose to stay here. 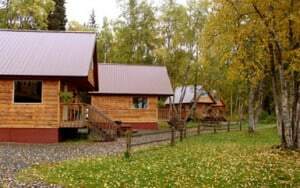 The Susitna River Lodge is a beautiful riverside Alaskan lodge located just a few minutes walk from historic downtown Talkeetna, Alaska. Adventurers from around the world use the Susitna River Lodge as their base for Denali flightseeing trips, jet boat tours, salmon fishing and so much more. © 2019 Susitna River Lodge. All Rights Reserved.